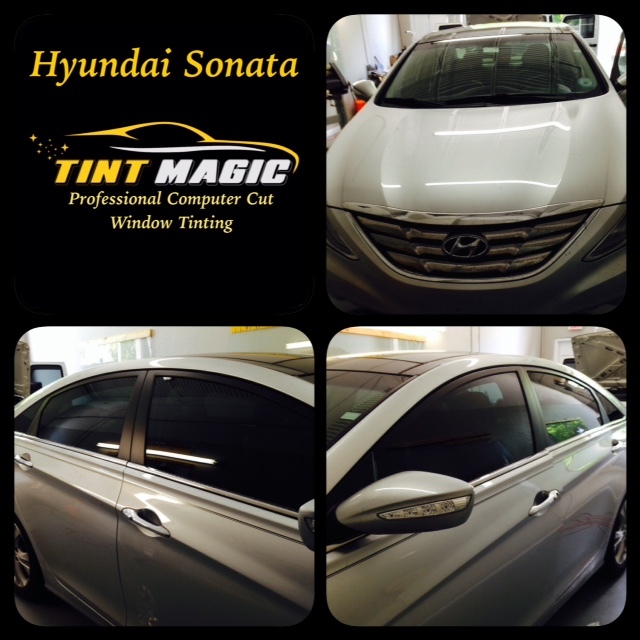 Hyundai Sonata Window Tinting looks great because we’ve applied Carbon CXP 35% all over the windows and get the best heat rejection and 99% UV protection! Styled at Hyundai’s Irvine, California, studio, the Sonata boasts striking sheetmetal that takes a few subtle cues from the sporty, coupe-like look of the first-generation Mercedes Benz C Class. The curvy and organic overall shape is an example of the “fluidic sculpture 2.0” design language that has become a hallmark of recent Hyundai models. The attractive look continues inside, where a squared-off design allows for a larger center console and a more convenient switchgear placement. Fit and finish is excellent, although material quality is only average and rear seat passengers will find somewhat limited headroom due to the fast roofline. Passenger space is more than adequate in most other respects, and Hyundai’s mid-sizer offers 16.3 cubic feet of cargo space. The Sonata is offered with Hyundai’s Blue Link telematics service, which can be spec’d to provide voice text messaging, point-of-interest web search and download, and automatic collision notification in addition to traffic, weather, restaurant and nearby gas station information. A dedicated application can transform a compatible smartphone into a remote control that can be used to turn the car on and off, turn on the rear defroster or set the climate control settings, functions that owners in cold climates will be sure to appreciate.